Wanting.... no needing!... a pair of white shorts made so a top can be tucked in, I have finally found 'the one'. There's nary any elastic waist in this pair! Burda 06/2018 #105 with deep pockets and side zip out of a brushed white twill fabric with sort of a denim weight made up well. You might remember my first version of this pattern and read all the construction details there as I did not change much in this pair. The heavier fabric made me ponder the idea that an invisible zipper might not be secure enough. Somewhere out there in cyberland, I remember reading that invisible zippers are made more for the lighterweight fabrics and if you have a heavier weight fabric you need to use an all-purpose zipper. After putting out my question on IG, Lori from Girls in the Garden let me know I was on the right track. Btw, her blog is fabulous where she shares many tips, tutorials and of course her beautiful garments. Thank you Lori! :) So, after not having put in a regular zip in aaaaagges, think I did a pretty good job with this one. And I love it! It's actually a lot easier to zip and unzip than the invisible zipper I put into my previous pair above. I don't know what happened to my motivation with this pair of shorts, but somewhere along the line it just left me. Though according to my notes this project was started on 7.12.2018 and completed 7.26.2018 so that is still a pretty quick make in my book...... for me. This fabric was bulkier than the earlier pair so it worked up stiffer. But I do like that and knew that it would fit in this way. ....as does this one as you can see below. But I finally realized my skillset just isn't at that point yet. And you know what? I'm okay with this now. It feels okay when standing and moving and maybe I need to be looking for a curved waistband pattern for another time. ...... as well as my first piece for July/August Make a Garment a Month Challenge hosted by Sarah Liz. ... and my sweet pup not sure at all about this state of affairs. She HATES water. Oh, almost forgot.... 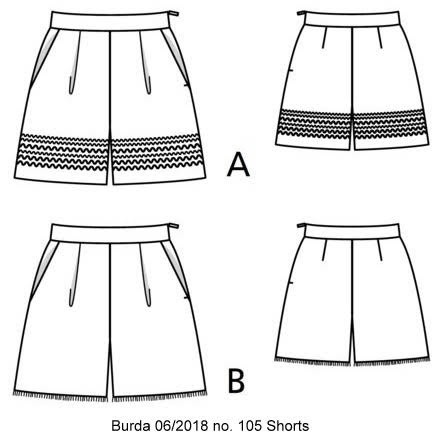 I'll be sharing this Burda 06/2018 #121 Top in a few days, shown here with the new Burda shorts we've been talking about today. *EDITED TO ADD*: You can read about the fluttery top here. We've had rain now for a couple of days on end. Quite strange weather in our neck of the woods for this time of year. Temps have cooled considerably which is very nice. Should be sewing for Fall, but have a few more things to finish for Summer first. 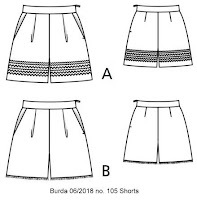 I subscribe to Burda and I'm sure if you look in your magazines you will find a curved waistband you can substitute for the straight if you want to try it. I agree that it is not a deal breaker but it's nice to try and compare options. Those are lovely looking shorts Lisa. I like how crisp and fresh the white fabric is. They fit really well too. Just as well I rethought visiting your blog - I wasn't going to because I thought I had already commented. But no, I commented on your post on IG! Really nice pair (two pairs) of shorts, just perfect for your country lifestyle. The little top looks pretty too.